There’s nothing quite like a classic rising crust pizza topped with your favourite ingredients. 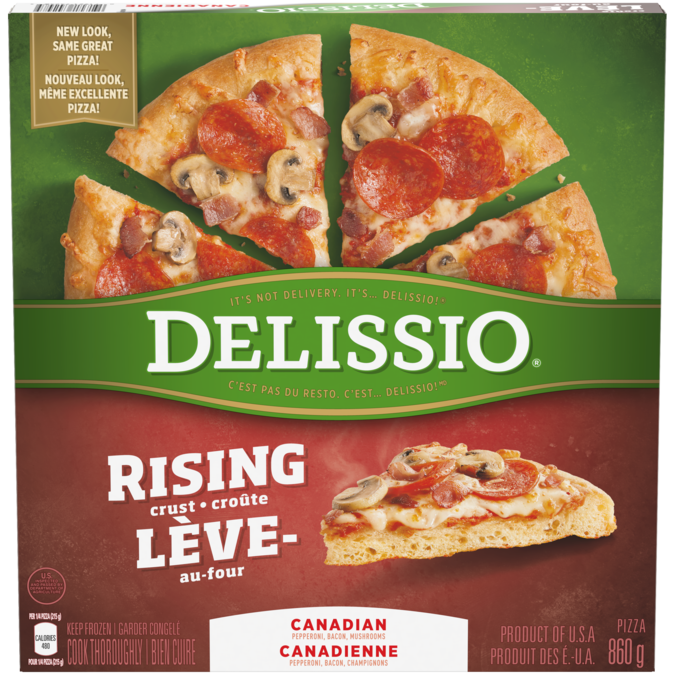 DELISSIO Rising Crust Pizza Canadian tops a high-rising, thick crust with juicy pepperoni, bacon, and mushrooms – the Canadian pizza trifecta! Whether treating yourself or pleasing a crowd, the soft and fluffy crust with a crispy outside makes every night an irresistible pizza night. Made with high quality ingredients, it’s no wonder DELISSIO is the Most Trusted Frozen Pizza Brand in Canada*. It’s easy to cook up a delish pizza that tastes just like delivery. It’s not delivery, It’s DELISSIO! The only door you need to open is your oven. It’s not delivery, it’s DELISSIO! Adjust oven rack to centre position. Your oven temperature may vary so adjust baking time and oven temperature as necessary. Pizza is done when cheese is melted and edges are golden brown. Let stand 5 min before serving. Caution: Pizza will be very hot. Handle with care. 2. Remove frozen pizza from all packaging. 3. Place pizza directly on centre oven rack. Bake 26–28 min. 3. Place pizza on baking sheet on centre oven rack. Bake 27–29 min.